Those large numbers are also super easy to read; Daily alarm and chime hourly; 12/24H format selectable, auto calendar; 1/100 seconds chronograph with split count function; EL backlight. Multifunction Watch: Calendar Month / Day / Date, 3 Alarm, Water Resistant, LED display, Shock Resistant, Stop Watch, Back Light, Compass, World time, Summer time, 12/24 hour, Countdown, EL backlight. Press “RESET” button, you will see a word “Compass” , then press “Start” button to make it working. Moving the Watch to different location, it will show direction on watch face. If no control in 60sec, it will quit to Time Mode. Otherwise you can press “Mode” Button to quit compass manually. In Compass mode, hold pressing Reset Button for 2 sec enter to correction. Press Mode Button to choice Manual Calibration (CAL) or Digital Equipment Calibration. In Manual Calibration mode, press Light or Mode Button, then turn watch two circle round in Clockwise or Anti Clockwise Direction Slowly. It will be finishing Calibration if the Dial show OK. If the Dial show FAIL, you need to calibrate again. No matter the watch show OK or FAIL, it will return to compass mode automatically. In Digital Equipment Calibration, press Start Button to increase degree number of North direction and press Light Button to reduce the number of degree. And press Reset Button to finish calibration, it will return back to compass mode automatically, pressing Start to continue to work. A good Gift: GOSASA Watch 1231 is a good choice for all ages. It has many digital functions such as Auto-Date, Alarm, Backlight & Stopwatch but and only use one CR2025 button battery. 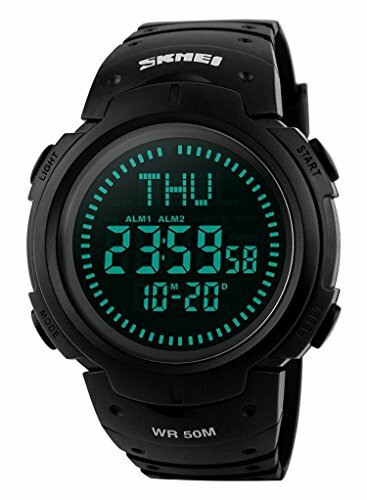 It is also shock resistant and waterproof to 50m and with the compass and world time design it’s a pretty much a good deal!